Who's most likely to win Notre Dame's QB battle? Notre Dame has a tough decision among three highly talented quarterbacks: Malik Zaire, DeShone Kizer and Brandon Wimbush. Who's most likely to win the job? Ohio State faced a virtually unprecedented situation when it began preparing for the 2015 season. The Buckeyes had to settle a three-way quarterback battle that involved a two-time Big Ten Offensive Player of the Year (Braxton Miller), a rising sophomore who set the Big Ten record for touchdowns in a season (J.T. Barrett) and a rocket-armed junior who made only three career starts but won the Big Ten championship, Sugar Bowl and national championship in that trio of games (Cardale Jones). A year later, Notre Dame coach Brian Kelly may have some sympathy for what Ohio State’s Urban Meyer went through. Though Kelly’s quarterbacks may not boast quite the résumés of Meyer’s, he must ultimately settle on a passer from a highly distinguished field of candidates. 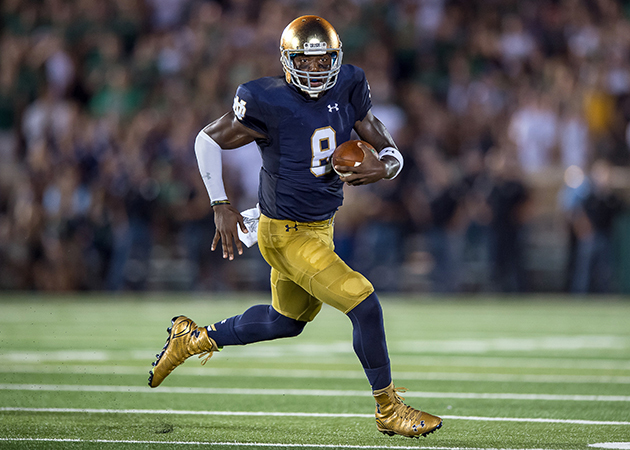 There’s the quarterback who leapt to the front of last year’s spring competition and got off to a sensational start in the 2015 season only to fracture his ankle in Week 2 (Malik Zaire). Or the quarterback who replaced him, steadied an offense besieged by injuries and led the Fighting Irish to 10 wins and a Fiesta Bowl berth (DeShone Kizer). Or the young hot shot who arrived on campus with much fanfare last year as the No. 6 quarterback recruit in his class, according to Scout.com, and now is eager to compete in his first full off-season of practices (Brandon Wimbush). • STAPLES: #DearAndy, who'll be the Buddy Hield of college football this fall? So whom will Kelly pick to guide Notre Dame’s offense this season? We’ll likely have to wait at least five months (and probably longer) for the answer. But for now, let’s size up the status of the race with whose stock you should buy, sell or hold. Let’s get the obvious one out of the way. Wimbush may have great arm strength and agility and the potential to be special, but he’s not going to leapfrog the two highly talented and more proven options ahead of him. While he hasn’t been officially ruled out of the race, he is getting fewer practice reps than Zaire and Kizer. It’s a good sign of his future in the program that he was given a chance to compete for the starting job despite the talent of ahead of him, but actually capitalizing on that to win the job was always going to be an uphill battle. Wimbush’s best bet is that a mixture of transfers and early NFL departures clears the field ahead of him and he’s able to step into a starting role next fall. Or who knows? Kizer entered last spring as Notre Dame’s third-string quarterback and wound up the starter for the bulk of the season. Zaire expressed his frustration at having to compete for the same job he competed for and won last off-season. “You just really wonder what it’s going to take to finally convince people enough that I’m able to do the job,” he said last week. While it’s understandable why Zaire would want to be named the starter, it’s hard to argue why he deserves to have it just handed to him. After all, he has attempted passes in just four career games for the Irish. That’s nine fewer than Kizer, who finished last season with a 63% completion rate, 8.6 yards per attempt, 2,884 passing yards, 520 rushing yards, 31 total touchdowns and 10 interceptions. It’s always tough to watch a player potentially lose his starting job due to an injury, but even Wally Pipp would have to agree that Kizer earned the right to contend for the top spot on the depth chart this fall. Despite his frustration and limited in-game experience, Zaire has a strong chance to prevail in this competition. After all, he beat out Everett Golson last spring to the extent that Golson opted to transfer from Notre Dame. And Kizer had little chance of unseating Zaire before his injury against Virginia. Zaire already has proven his worth in a position battle; he could easily do so again. Why should Kizer be the favorite to start? Because the memories of him nearly leading the Irish to the College Football Playoff aren’t likely to fade quickly. Almost literally from the moment he was unexpectedly thrust into the starting role, Kizer showed the poise to handle the job. His 39-yard touchdown strike to Will Fuller rescued Notre Dame in the final seconds against the Cavaliers, and he continued to put forth solid performances. Kizer’s only truly poor start came against Boston College (three interceptions), the No. 1 defense in the country last season. He even looked worthy of the job in Notre Dame’s two losses: Kizer passed for 321 yards and rushed for 55 more against Clemson’s vaunted defense despite monsoon conditions and a hostile atmosphere, and his last-minute touchdown against Stanford looked like a game-winner until Kevin Hogan pulled off some even later heroics. Zaire’s irritation about how much he has to do to prove he’s “able to do the job” is fair; it’s just that Kizer has even more proof on his side. Ultimately, considerations about what each quarterback has done in the past will cease to matter much. This competition will likely linger into the start of the season, at which point those performances will carry more weight in Kelly’s eventual determination. A late decision would create interesting possibilities about Notre Dame’s future under center. This fall will be Zaire’s fourth year on campus but only his third year of eligibility. Should he lose the competition to Kizer, he could become an ideal candidate for a graduate transfer, which would make him immediately eligible to play for another school in 2017. Plenty of programs would surely be happy to have him.